Kev and I booked our rental car through E-Z Rent A Car well in advance of our Florida vacation. We got a couple great deals and I was happy with the easy booking process. To be honest, I chose them because they were active on social media AND they were the most affordable of ALL other rental cars for that time frame. We arrived July 3 and returned the car July 9th. I made sure to join their FREE E-Z Money program beforehand so we could accumulate points, get instant discounts, fast rental pick up and more. We don’t have too much more to go to get our 1st $20 credit. 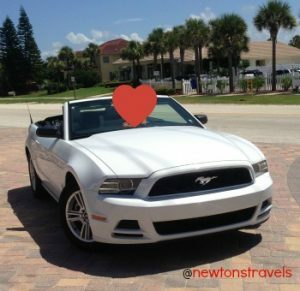 We initially booked a compact car but as you can see and those who followed our travels on Facebook, Twitter & Instagram know we upgraded for an amazing deal to a convertible. THAT was a great decision on hubby’s part. What a nice treat. Thanks honey. The check in process was great (I wish I remembered the names of the guys who helped us), we were given all the info we needed and pointed in the right direction to go pick up the rental car. It wasn’t a far walk from the Orlando terminal at all. Just across to the parking garage and up the elevator. We handed over our paperwork to the E-Z Rent A Car service desk and he gave us the keys. I saw a bright green convertible out of the corner of my eye an prayed it was ours. No luck! But we got a white one and it was just as nice. After packing up the car and familiarizing ourselves with all the gadgets and then testing everything, we set up our Garmin. Then we hit the road the 1.5 hours to Ormond Beach, FL to where our friends live. It was a truly awesome drive with the top down. Glad I brought a hat! We didn’t think we would drive as much as we did and almost every where we went had beautiful scenery so we were extremely glad we made the decision to upgrade. We drove to Daytona, Ponce Inlet, to the NASCAR race, NASA/Kennedy Space Center and St. Augustine. Amazing vacation made even better with a cool car. The check in process on the return was just as seamless. We pulled right in, the lady had us empty the car while she checked it over, had me sign her iPad for an emailed receipt and we were off to the terminal. 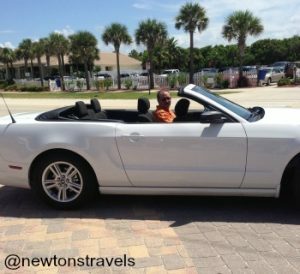 If you ever plan to vacation in Florida, rent from E-Z Rent A Car and treat yourself to a convertible. You won’t be disappointed! E-Z Rent A Car has locations all over the U.S. and Canada. I don’t think you can go wrong when renting from them. I see they have cars in Jamaica but I don’t think Kev and I would ever be brave enough to drive there. Nope, not happening. We’ll stick with our little puddle jumper plan over to Negril from Montego Bay.